My kingdom Re-Imagined is absolutely brilliant! Very very beautiful indeed, but I hear som digital clipping sounds throughout path 8 on the FLAC and MP3 download from fsoldigital.com Can anyone pass this on to the guys so they can make new files ? Ross? Pande? 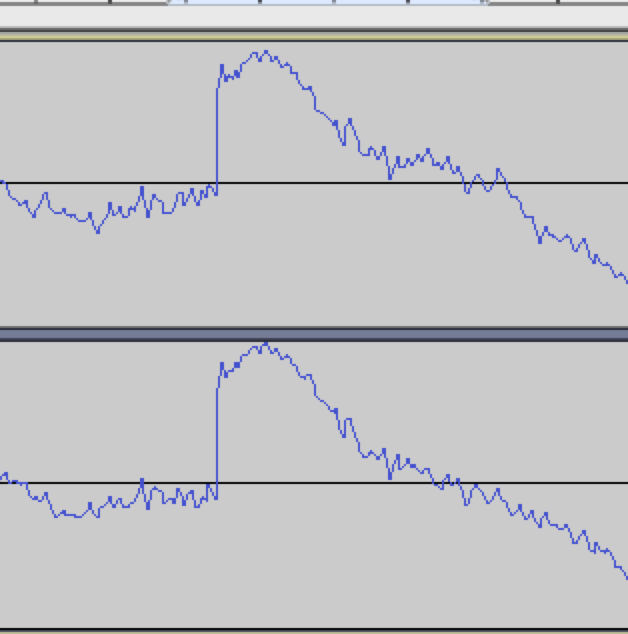 Its on almost every kick drum throughout, if you open the FLAC file in audacity and zoom in you can actually see that it is a digital error. Ok, upon first listen I would say a clear mixture of the classic 97' sound and the sound of the last few FSOL-releases from Env6,6.5 and AEV and a few hints on 'The Cartel'-AA here and there sample-wise. Very electronic and experimental sounding. The whole album is mastered quite loud like it was already the case with Env 6/6.5 , but listening with speakers I had no special concern about hearing clipping sounds. Not everything clicked with me instantly, further listens are necessary to fully sink in. Quite complex at times. Tracks 7 & 8 are brilliant. The two CD-bonus tracks definitely fit the end of the album more than those on AEV. Edit: is it just me, or does the Vangelis-sample throughout Path 7 sound like it was replaced by an actual recorded singer? Ok, on my third listen now, this is amazing. Turns out, the FSOL stuff which took me a few listens more to get into, appears as even their strongest stuff. Dennis wrote: Edit: is it just me, or does the Vangelis-sample throughout Path 7 sound like it was replaced by an actual recorded singer? I believe Rebecca Caine is credited, probably from the same sessions as 'Everyone in the World'. I'm waiting for the CD to listen to this. It's so long since I actually waited for the physical to listen to a new FSOL album that I really fancy trying to recapture that. I want to get the digital download, but I'm put off if there are errors in the encoded files. Does anyone know if there are indeed errors? And if so are they being fixed? Just downloaded it. I agree I don't think it's an encoding error. I hear the first kick like it is slightly misaligned with another kick and a slight click on the second one. It sounds off, but definitely think it's how it is supposed to be. You'd think after all these years, they'd be trying to make The Isness a slightly less confusing release. But no, it seems several tracks on the new Abbey Road releases are unreleased versions, different to the 2002 Abbey Road mixes So now we have another version of the album! Yes, Meadows has about 30 seconds more on the new version, never heard before vocalizing. Her Tongue is shorter without the orchestral intro. There are few more differences, but the tracks that are the same, are 100% same, like, it's certain they come from the same studio and the same mastering. So, My Kingdom. That click is present on the CD version so it's not a FLAC encoding error. It's probably intentional, although it's a bit hard to listen to. The rest of Path 8 is bloody excellent though, best part of the record for me, along with Old Empire. It'll take a while to get used to I think, the mix of old and very familiar sounds with newer EMS/Halia-style FSOL and Amorphous psych hints. Time will tell, but it's definitely a strong one. No Vangelis or Morricone in the credits, which explains why the flute in Path 7 sounds quiet / different - some kind of re-recording - and why the vocal is the Rebecca Caine take rather than the original sample (I wouldn't be surprised if they actually had her record that vocal melody back in 1996 in case they couldn't get the Vangelis sample cleared). I'm guessing they didn't have the money to license those samples out again, which is why they're recreated here. The Caine vocal is a bit jarring at first as it's quite different to the Hopkin one, but I'll probably get used to it over time. After a few listens I very much prefer the Caine-vocals over the original now, it has that epic 'Everyone is doing...'-feel to it, and there are some cool reverb effects, like the echoing sounds on the original 'Everyone...'-track. I especially love the oldschool-sounding of some of the tracks. I wonder how much material from the 90ies is used in this album, 'Populate' for example sounds very ISDN-like, can't quite place from which track the opening synth-growling sound is, it's definitely something from ISDN. Dennis wrote: After a few listens I very much prefer the Caine-vocals over the original now, it has that epic 'Everyone is doing...'-feel to it, and there are some cool reverb effects, like the echoing sounds on the original 'Everyone...'-track.